Description: Many-stemmed subshrub, usually 40–80 cm high. 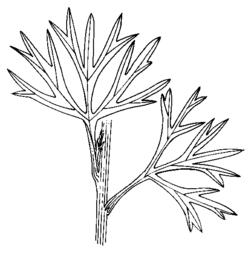 Leaves 20–40 mm long, usually ternately divided into 3–9 segments; segments of divided leaves and entire leaves flat, linear to lanceolate, 2–20 mm long, 2–3 mm wide, midvein distinct, glabrous. Conflorescences spike-like, terminal or in the upper axils, 2–6 cm long. Perianth 4–5 mm long, pale yellow. Distribution and occurrence: Grows in wet or dry situations in heath or dry sclerophyll forest, mainly in higher parts of the Blue Mtns and adjacent areas.